Veggie Prom West announces tickets to inaugural dance party and fundraiser in Los Angeles to benefit animals. Los Angeles, CA– Veggie Prom West, the inaugural animal advocacy fundraising event in Los Angeles, announced that tickets are on sale to the veggie-friendly community at large. 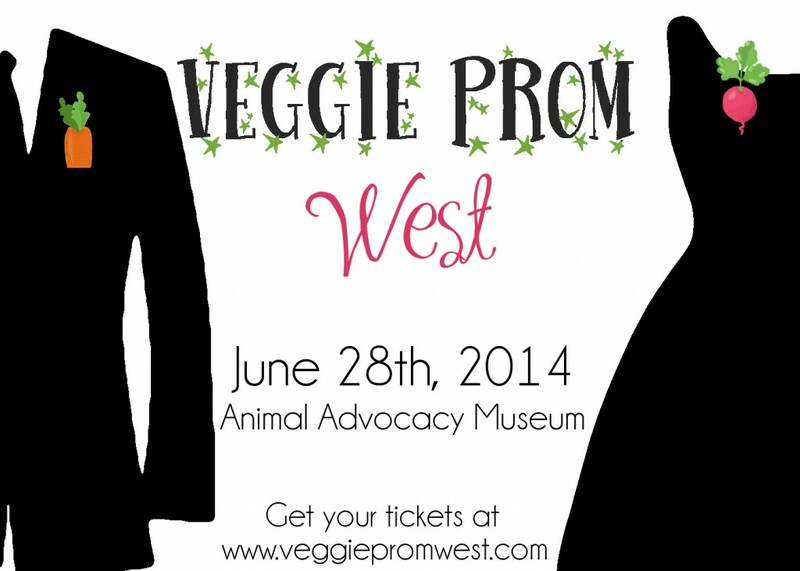 Veggie Prom West is a prom-inspired event aimed to raise money for charities dedicated to animal advocacy. Guests at Veggie Prom West will enjoy music, dancing, complimentary vegan food and drinks, raffles, prom photos, and entertainment similar to their own high school proms, but revisited with a compassionate flair. The 2014 beneficiaries are The Gentle Barn in Santa Clarita, California, and the Animal Advocacy Museum in Woodland Hills, California. Guests will be eligible for prom court, take part in flash mobs portraying iconic prom scenes such as Hand Jive from Grease, and win raffle prizes donated by noted vegan companies like Phoney Baloney’s Coconut Bacon and The Tree Kisser apparel. The 21+ event will take place at the new Animal Advocacy Museum in Woodland Hills, California on June 28th from 7pm-12am. Tickets are $45 until May 17th, $55 after May 17th, $65 after June 14th, and $75 at the door if event is not sold out. Following in the footsteps of the successful NYC Veggie Prom, which is in its fourth successful year, Veggie Prom West plans to vet the vegan and vegan-friendly communities en masse. The voting system for Prom Nominees will be debuted on May 19th via Facebook page with a live vote at prom for king and queen. Steven Todd Smith is the social media manager for Forks Over Knives, the film that “examines the profound claim that most, if not all, of the degenerative diseases that afflict us can be controlled, or even reversed, by rejecting animal-based and processed foods.” He is also the creator of a Creative Night of Compassion, which debuted in Los Angeles in 2014. At Compassion, artists and animal lovers joined forces to raise money for Farm Sanctuary while enjoying the many talents of the gifted performers of the evening. Steve’s ability to connect members of the vegan community through food and compassion are tantamount to VPW’s success. Jessica Schoech is the CEO of The Vedge App, the up-and-coming mobile app that will revolutionize the veg food finding experience worldwide. For three years, Jessica has devoted her time to creating a brand for The Vedge via social media prior to the launch of the app. Her attention to detail, research of marketing trends, and dedication to social engagement lend themselves well to the campaign for a successful Veggie Prom West for years to come.